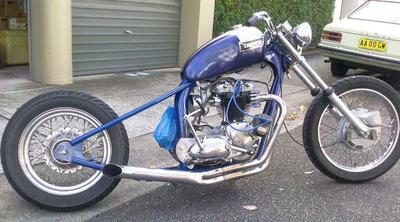 From Sydney, Australia: This is my 1973 Triumph Tiger with hardtailed OIF frame. 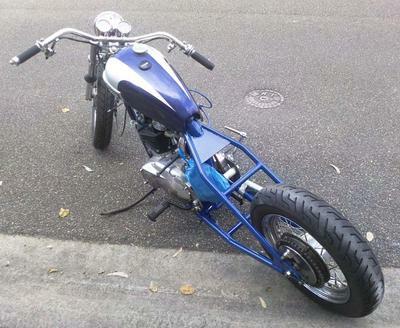 It was my daily rider for about a year before I had the hard tail welded on. The front was already raked with about 2" over forks but I thought the bike looked wrong, hence the 6" stretch and 2" drop. 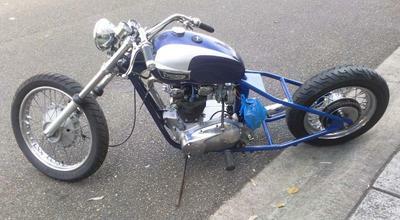 It runs a 1973 650 with a hunt magneto, 5 speed box, 16" rear. I'm not sure whether use the 2 into 1 or the original headers with hot dogs. It seemed to run better with the hot dogs than the 2 into 1. This project has been stalled for about a year since I had a 60mph bike accident that destroyed my shoulder but hope to start it again soon. Join in and write your own page! It's easy to do. How? 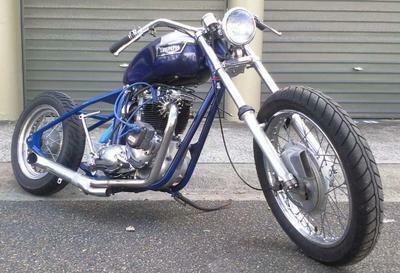 Simply click here to return to Triumph Choppers.